Set amongst 10 acres of beautiful gardens, The Holiday Inn offers air-conditioned rooms with a private balcony or direct garden access. It features a fitness centre, swimming pool and restaurant. Guests can enjoy free on site parking. 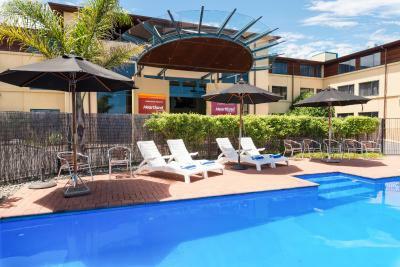 Just 8 minutes’ drive from Auckland Airport, Hotel Grande Auckland Airport offers rooms with a private balcony or patio. It features an outdoor swimming pool, a fitness centre and a sauna. Free on-site, overnight parking is available. Auckland Airport Kiwi Hotel is located just 10 minutes’ drive from Auckland Airport and offers a free 24-hour shuttle service from the airport to the hotel. All rooms include satellite TV. Guests receive 200MB of free WiFi per stay. 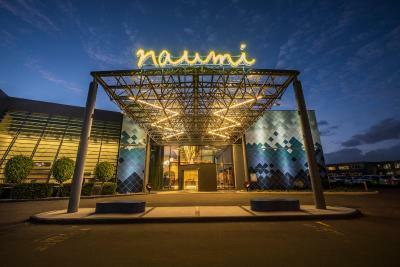 Just 3 minutes' drive from Villa Maria Estate and a 3-minute drive from Auckland Airport, this hotel has an indoor pool, a restaurant and a bar. Just 5 km from Auckland International Airport, Auckland Airport Lodge provides free airport shuttles to and front your flights, and free parking for up to 10 days. Guests receive 250MB of free Wi-Fi. Just 10 minutes' walk from the domestic and international terminals at Auckland Airport, ibis Budget Auckland Airport features modern rooms with a flat-screen TV. It offers a 24-hour front desk and an internet kiosk. Located just 5 km from the airport, Auckland Airport Kiwi Motel offers free WiFi, a free 24-hour airport shuttle and a 24/7 reception desk. All rooms include cooking facilities and cable TV. Guests receive 200MB of free WiFi per stay.